Russia’s government has approved allocation of funds to the United Aircraft Corporation (UAC), for use in development of an Indian-Russian multirole transport aircraft (MTA); the MS-21. The Russian government has proposed that funds allocated in the 2016 federal budget to the authorized capital of the United Aircraft Corporation (UAC), be directed to the development of Indian-Russian multirole transport aircraft (MTA) – the MS-21 aircraft family. Alexey Lavrov, Deputy Finance Minister, stated this while introducing an amendment at a meeting of the State Duma Budget and Taxes Committee. The corresponding amendment to the draft federal budget for 2016 has been proposed by the government. Lavrov said the development of the MTA aircraft project is being delayed. “In this connection, we are proposing to authorize the capital contributions, being made from the state budget, be directed towards the building of the MS-21 aircraft,” he said. Andrey Makarov, Chairman of the Budget Committee, proposed postponing the decision on this amendment until November 27. “These funds are there all the time; they are not being used and are sitting in the deposit accounts of the company. Let us postpone this amendment until Friday,” he said. The parliamentarian asked to have an official briefing paper submitted by Friday, showing what kind of proceeds have been received in connection with this project, how are they being used, and how much additional funding is being proposed for the UAC from the federal budget. The UAC has significant unused funds sitting in its bank accounts, received in the form of contributions to its share capital in 2009 and 2011 from the Ministry of Industry and Trade. These were made to finance Russia’s obligations in this project, involving the building of a Russian-Indian multirole transport aircraft. The UAC, with approval of the Ministry of Industry and Trade converted these unused funds into US dollars in 2011. The resulting income, from 2011, amounted to 539.1 million rubles and $24.3 million, or around 1,534 billion rubles, while the remaining unused contributions to share capital on October 30, 2015 (taking into account changes in the ruble/dollar exchange rate) now amounts to 17.857 billion rubles. The Chamber of Accounts has noted that there was no information available on the completion of negotiations or on the conclusion of a contract to perform experimental design work on the development of the MTA. No decision has been made on a schedule to utilize the unused UAC funds. In this regard, the Chamber of Accounts has proposed that UAC distribute these unused funds as contributions to the charter capital of its subsidiaries, subject to a corresponding decision by the Russian government. 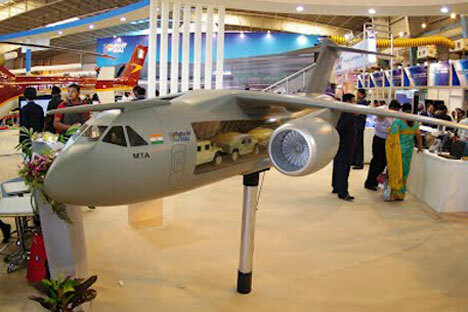 An intergovernmental agreement between Russia and India to jointly develop and build the MTA aircraft was signed in 2007. This was the first time that these two countries had concluded an agreement on equal-share joint financing of a new project in the aircraft industry. This aircraft is to be manufactured in both Russia and in India. According to its technical specifications, the MTA is classified as a medium military transport aircraft, which can carry a wide-variety of cargo weighing up to 20 tons at distances of over 2,000 kilometres, using paved and unpaved runways. The aircraft will also be able to operate from high-altitude airfields in any geographic and climatic conditions. The MS-21 is a Russian airliner that was built to replace the Tu-154 and Tu-134. The MS-21 comes in three versions: MS-21-200 (150 seats), MS-21-300 (180 seats) and MS-21-400 (212 seats). Earlier, Yury Slyusar, head of the United Aircraft Corporation reported that this aircraft would be rolled out in Irkutsk later this year, and is expected to take its first flight in mid-2016..